t*rexes and tiaras: Handmade is best..
Because it seems like quite a while since I last updated, I've collected together some photos of a few of the things I made over the festive period because I'm coming to the conclusion that handmade really is best. 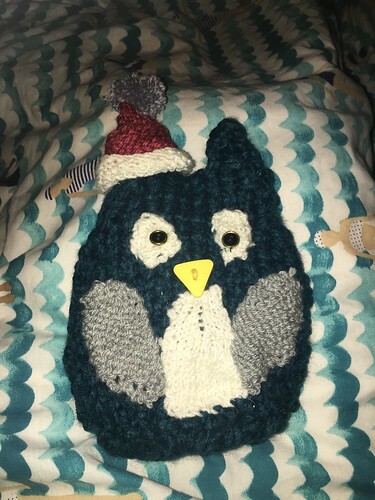 I consciously made an effort not to try and commit to too many handmade presents because I find that I have less and less spare time to get things finished, but I made a few exceptions. This owl was something I made for a Secret Santa I was part of, where the only rule was that all presents must be handmade, so I raided our knitting books for something which my owl-loving recipient might like, and used it as a bit of a stash-buster, finishing off some scraps of wool from my collection, too. Double win. 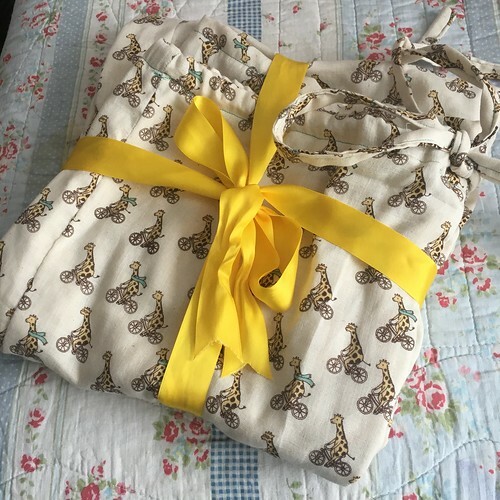 These PJs were supposed to be a present for something else, before Xmas, but I didn't have a chance to make them when the fabric first arrived with me from Japan, so I squirrelled it away until December, where I made a fairly simple pair of pyjama trousers from a Simplicity pattern I've adapted over the years and added them to the present parcel I was sending to a friend. 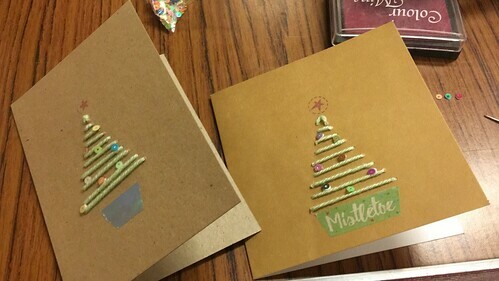 I've always preferred sending handmade cards to shop-bought ones and that's a childhood tradition which doesn't seem to be showing any sign of subsiding. Some years I'll have a theme to stick to, but this year I took all of my card-making bits to Rangers and we just...made. This wool tree design was something I'd tried a similar thing to in the past with hearts, but I like how simple they look and made quite a few of these this year. Another Christmas parcel staple for me - melted snowman bark. 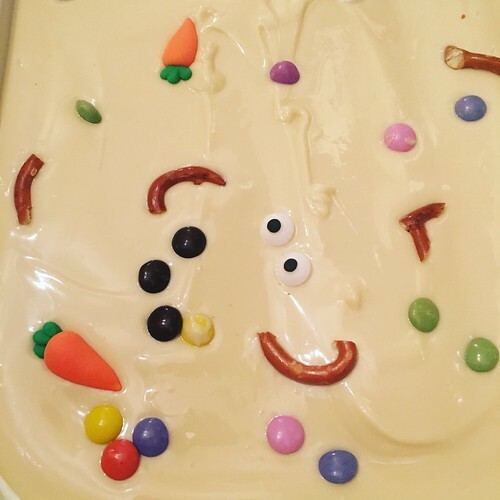 This is so simple to do and looks effective; just melt white chocolate and add Smarties, sugar carrots and sugar eyes, pretzels or matchmakers to look like twigs and arms - whatever you have to hand, really. Leave them to set overnight in the fridge and then break them up to send out in little bags. Always well-received! 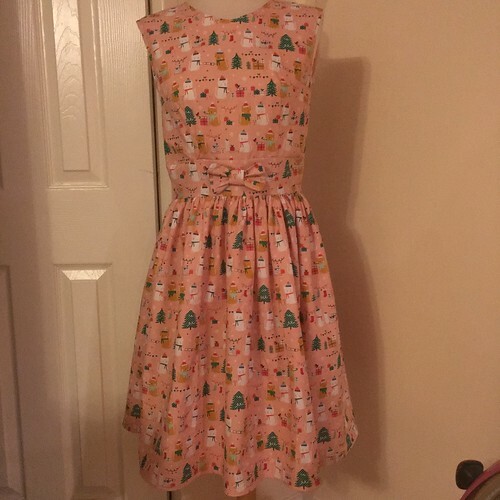 Despite having plenty of festive frocks to wear already, I rediscovered this fabric in my trolley a little before Christmas and decided I wanted to try and get it made into a dress to wear over the holidays. I think I bought it in a closing down sale on a website at one point and then ran out of time last year. I went with the Mortmain pattern, which is a tried and tested one for me, and added a little bow from the leftover scraps to the waistband. I wore this on Christmas Day and a few others over the holidays and really like the festive kittens. Lovely makes. I'm going to remember (and make) the melted snowman bark for sure!